What online degree do I need to become a pharmacy tech? How can I get a pharmacy technician degree online? How do I find accredited online pharmacy tech programs? Are there scholarships and grants for pharmacy technicians? Pharmacy technicians form the backbone of any pharmacy. While pharmacists get a lot of the attention and credit, it’s usually the pharmacy technician who does the bulk of the work, including processing and filling prescriptions, measuring medication amounts and organizing inventory. As a result, serving as a pharmacy technician carries a lot of responsibility that necessitates specialized training. Want to learn more about how you can become a pharmacy tech? Start with these frequently asked questions about the process, and learn how to earn your degree online. Deciding among the best accredited online pharmacy technology programs can be a bit subjective. Some students will prefer extra attention from their professors while others will need to keep tuition costs as low as possible. Still others may prefer a school in a particular location, since that’s where they want to work after graduating. Because of this, it’s easy to see how certain factors must be considered when deciding on the best program. Therefore, the following ranking doesn’t just list schools that are the best; it also provides information about the various factors prospective pharmacy technology students might heavily consider when choosing a school. Accredited by the Council on Occupational Education, Central Louisiana Technical College offers work-ready programs for students looking to gain the technical skills needed to quickly enter the workforce. The college's pharmacy technician certificate program is designed with these goals in mind as well. Students can complete the certificate in as few as 9 months by completing 2 semesters of 29 credit hours of coursework. The coursework includes classroom and lab instruction on the college's Ferriday campus and supervised clinical externships where students will work with preceptors from various sites, such as hospitals, retail pharmacies and community sites, to fulfill the clinical certification requirements. The program begins in the fall semester, which begins in August, and concludes with the spring semester in May. Courses students can expect to take include introduction to computers, pharmacy technician fundamentals, pharmacology and professionalism for the pharmacy technician. The college prides itself on providing innovative training and instruction and strives to increase the community's awareness of their educational offerings. The college provides both state and federal financial aid opportunities, and several scholarships are available specifically to Central Louisiana Technical College students, such as the Brian Caubarreaux Do It Right Scholarship and the Horatio Alger National Career and Technical Scholarship. Altierus Career College's pharmacy technician program offers a streamlined approach for students who wish to enter a career in pharmacy quickly. Their 8-month program has a flexible structure that allows students take courses 3 days per week in a blended format through on-campus and online courses. Students complete 48 credit hours by taking general courses in subjects such as health care, ethics of pharmacy, pharmacology, pharmacy operations in retail and hospital settings, and medical calculations. Because of the industry requirement of hands-on clinical experience, the program also requires a clinical externship where students can put their coursework into practice. Enrollment is ongoing, so students who have completed high school and an academic assessment administered by Altierus can enroll any month of the year. The curriculum is also designed to prepare graduates for industry certification. Financial aid is available to qualifying students, and the Zenith Student Grant has a multimillion-dollar pool of funding to award to students of Altierus in financial need. Altierus also provides personalized academic support through coaching, confidence-building interview preparation and job search assistance. Altierus is accredited by the Accrediting Commission of Career Schools and Colleges (ACCSC). North Seattle College's pharmacy technician program makes it easy for anyone with compassion and strong communication skills to enter into a career as a pharmacy technician. Students who have successfully completed intro-level math and English courses can enroll into this program to quickly launch themselves into a career in pharmacy. The established Pharmacy Technician Certificate program, which started in the 1980s, consists of 53 credit hours and takes 9 months to complete. The program offers hands-on externship experiences that often end up placing the student in a full-time position with their externship site upon graduation. Cohorts begin every September, and the program is run by experienced pharmacy professionals. The first quarter includes intense lecture courses, and the second and third quarters involve a combination of on-campus coursework 2 days a week and externship placements at sites such as retail locations, community sites and hospital pharmacies where students will put their skills into action and interact directly with patients. The coursework leads to the national certifications needed to work as a pharmacy technician, and 99.6% of North graduates pass their exam. Because of the 432 hours of externship experience (as opposed to the minimum requirement of 200 hours of clinical experience), North graduates are even more prepared for the workforce. In the Seattle-Bellevue metro area, entry-level positions can range from $15.48 per hour to $26.21 per hour with additional experience. The certificate program at North is accredited by the Washington State Board of Pharmacy and the American Society of Health-System Pharmacists (ASHP). Students at Hutchinson Community College can earn a pharmacy technician certificate in 3 semesters of full-time study. Many of the courses are available in an entirely online format, but students are required to attend an on-campus lab each semester they are enrolled in the program. Online courses are self-directed and can be completed at a student's own pace. Students learn theory, gain hands-on experience and work in clinical settings throughout their path in the Pharmacy Technician Certificate program. They may also choose to take an extra series of 2 classes offered in the program that focus on developing customer service skills. In order to earn their certificate in pharmacy technology from Hutchinson, students must sit for the national Pharmacy Technician Certification Exam (PTCE). On-campus, students can access the Rimmer Learning Resource Center for free tutoring, supplemental instruction, library access and online resources. The Student Success Center provides access to free career counseling and personal counseling as well as academic resources that students can explore. Pharmacy technology students are eligible for a range of institutional scholarships to help pay for their certificate program, all available through a single application form. Financial aid advisors are available to answer questions about financial aid. Hutchinson also assigns academic advisors to help students plan out their academic and career goals and to assist with clarifying transfer credit information if a student wants to apply previous credit toward their certificate or degree. The Lakeshore Technical College Pharmacy Technician Diploma program is offered in an online format at technical colleges across the state of Wisconsin as well as on-campus at Lakeshore's Cleveland, Wisconsin, campus. The program, accredited by the American Society of Health-System Pharmacists, can be completed in 2 semesters as a full-time student or in 3-4 semesters as a part-time student. Students are required to engage with clinical settings in a 16-week internship program and can choose to focus completely on community and retail pharmacies or to receive training in a community pharmacy and a hospital pharmacy. Online students will experience live, interactive video classes and be placed in local internships while taking general studies classes at their local technical college. Through a partnership with the pharmacy software vendor PioneerRX, Lakeshore's online program provides students with interactive tools that simulate daily pharmacy workflows and tasks. Students in the pharmacy technician program are eligible for financial aid to pay for their diploma program. There are online career resources available to students on Lakeshore's Career Coach website and academic tutoring, career coaching and career placement resources available through student support services. Credits from Lakeshore's programs are transferable to over 30 universities, and some Lakeshore programs may accept credit for prior learning. Lakeshore also offers an Employed Pharmacy Technician certificate for pharmacy technicians who have received prior training on the job. Because these students already have developed their practical skills, this 1-semester certificate program focuses on pharmacy technician theory to prepare graduates for the national Pharmacy Technician Certification Exam (PTCE). North Dakota State College of Science offers a 1-year certificate or a 2-year associate degree program in pharmacy technology. Along with learning the practical skills to be pharmacy technicians, students take courses in communications, writing, psychology and speech to further advance their careers in this field. Both programs also require students to complete 2 community and health care facility-based internships to develop their understanding of the duties of a pharmacy technician. Each internship lasts 4 weeks and is taken at the end of the program. Graduates are prepared to become nationally certified and can register with the North Dakota Board of Pharmacy. Students in either program have the option to complete their program in several ways; students can take courses fully online, attend the program on-campus at NDSCS-Wahpeton or attend general education classes at Bismarck State College, or take technical classes from NDSCS faculty through online classes. It is also possible for students to take their general education courses at the NDSCS-Fargo campus while taking the technical pharmacy technology courses online. The college offers merit-based and program-specific scholarships as well as federal, state and college-based financial aid to students. Active duty veterans, National Guards or Reservists, and dependents of veterans are eligible for military benefits at NDSCS and can earn their pharmacy technology associate degree in a fully online format. They may also receive academic credit for previous experience and skills that are applicable in this field. Students can earn a certificate in pharmacy technology in 5 months of on-campus study at Pickens Technical College. Graduates from this program are qualified to work in retail or mail-order pharmacies, hospitals, nursing homes or assisted living centers. To earn credit toward their program, students can provide an account of previous education, work experience, training or any other informal education in pharmacy technology. Military veterans can also submit their Joint Services Transcript, and Pickens Tech may award credit toward the certificate program. The college provides several other military benefits to active duty military personnel and veterans, such as resident tuition rates for members of the military who move to Colorado on a permanent-change-of-station basis. The Pharmacy Technician Certificate program, accredited by the Council on Occupational Education, prepares students to take the Pharmacy Technical Certificate Board Exam at the end of the program if they wish to do so. All students have access to career advising services and resources through Pickens Tech. There are a range of scholarships available to students; however, Pickens Tech does not offer student loans. Academic credits earned at Pickens Tech can be applied toward other higher degrees, and the college has a special partnership with the Community College of Aurora. Pharmacy technology students who earn their certificate at Pickens Tech can continue general education courses and go on to complete other requirements at the Community College of Aurora to earn their Associate of Applied Science degree or Associate of General Studies degree in pharmacy technology from this college. The University of Montana offers students a hybrid program to pursue a Certificate of Applied Science in Pharmacy Technology. The 2-semester program incorporates online courses and hands-on learning opportunities in UM-Missoula's pharmacy lab at the River Campus. Applicants must demonstrate college-level skills in writing, math and computers as part of their application process. Accepted students are expected to register as Pharmacy Technicians in Training with the state of Montana while attending the program. Graduates must sit for the national Pharmacy Technician Certification Exam (PTCE) in order to earn their certificate from this college. UM-Missoula provides a range of support services for students, including an academic advising center and workshops to develop study skills and learning strategies. The college also participates in TRIO Student Support Services, a federally funded program that provides services to increase college graduation for eligible students who are seeking their first undergraduate degree and are either low-income or first-generation college students. Students can also take advantage of UM-Missoula's financial aid services to help pay for their pharmacy technology certificate program. Financial aid opportunities include scholarships based on skill or academic potential that individual departments can award to students. UM-Missoula offers additional student support services, including career services, a writing center, disability services and academic advising. Veterans can use their military benefits while attending this college, such as education benefits for degree and certificate programs under the Montgomery G.I. Bill program. Eastern New Mexico University-Roswell Campus offers students the opportunity to earn a Certificate of Employability in Pharmacy Technician through a 1-year program. The program, which is accredited by the Higher Learning Commission, culminates in a preceptorship in a pharmacy in the final spring semester. Graduates are prepared to take either the national Pharmacy Technician Certification Exam (PTCE) or the Exam for the Certification of Pharmacy Technicians (ExCPT). As certified pharmacy technicians, students will be qualified to work in retail pharmacies, hospitals, long-term care facilities and compounding pharmacies. While enrolled at ENMU-Roswell, pharmacy technician students can benefit from individual academic and career support services, job interview and resume skills development workshops, networking opportunities and job placement support through the federally funded SUN PATH program. SUN PATH is designed to assist veterans and their spouses and ESL, GED and Developmental Education students in particular. ENMU-Rowell also offers TRIO Student Support Services for low-income or first-generation college students seeking an undergraduate degree. Eligible students can access resources to help them transition into, stay enrolled in and graduate from college. ENMU-Roswell provides financial aid and scholarship resources to any student who has the financial need, including undocumented students. Students who submit their FAFSA can apply federal loans to fund their pharmacy technician certificate as well as state grants and scholarships. Veterans and members of the military can find resources on funding their education at ENMU-Roswell using their military benefits. Ridge Technical College is a part of Polk County Public Schools' Education Pathways programs for adult learners who are seeking career training in Florida's Polk County. The pharmacy technician program at Ridge Technical College is a year-long program with on-campus instruction. This is not a residential college; instead, students can take the required courses in Ridge Technical College's classrooms during the day or in the evening, depending on their schedule. Students in the pharmacy technician program also gain practical experience in the college's campus lab setting in Winter Haven, Florida. In addition to developing an understanding of the practical techniques and duties of pharmacy technicians, students learn about a range of topics within the health care industry, including finance, labor issues, technical and production skills, and community health issues. Graduates of the pharmacy technician program are prepared to take the national Pharmacy Technician Certification Exam (PTCE). After registering with the Board of Pharmacy, graduates are then eligible to work in hospitals, clinics or retail pharmacies. Of the students at Ridge Technical College, 90% qualify for financial aid after filling out the FAFSA. Some career programs may also qualify for Veterans' benefits, and Ridge Technical College has a Financial Aid Fee Revenue Scholarship available for students. Financial aid coordinators can help students through the process of applying for financial aid. In addition, career assessment and counseling resources are open to all students to help direct their educational and career path choices at Ridge Technical College. Students can earn their certificate to become a pharmacy technician online through Barton Community College. This 29-credit hour program is designed to be completed in 2 semesters of study through an entirely online format. There are no set times for classes, so students can work within their own schedules to earn this certificate. Barton requires students to complete an internship at an approved pharmacy site, which offers practical experience in pharmacy work to students. Graduates from the program are prepared to take the national certification exams for the Pharmacy Technician Certification Board (PTCB) and go on to work in a variety of settings, including hospitals, nursing homes and department stores. The college offers free online tutoring through Tutor.com as well as career counseling resources. All students at Barton are eligible for financial aid, which includes state, community-level and college-level scholarships and grants; Federal Direct Loans; and Federal Work Study. Students interested in enrolling in the pharmacy technician program while they are in the army, or who are veterans, can participate in Barton's Concurrent Admissions Program (ConAP). ConAP is a joint program between the U.S. Army Recruiting Command and Barton that allows members of the military to enroll at Barton as they enlist or defer class enrollment for up to 2 years after they are discharged; this program offers matriculation options for veterans as well. Armed Forces personnel and their spouses may be able to use their military financial aid options to pay for their pharmacy technician certificate program. The smallest community college in the state of Iowa boasts a graduate employment rate of almost 100% and a student faculty ratio of just 13:1. Accredited by The Higher Learning Commission, NCC offers a 2-semester, 32-credit, 10-month pharmacy technician diploma program, as well as an undergraduate certificate that may be earned with an additional 7 credits. Pharmacy technicians working in Iowa must be nationally certified by an accredited technician certification board that is approved by the Iowa Board of Pharmacy, and this NCC program will assist students in preparing to sit the certification exam. The program begins in fall and courses are offered on campus. Tuition for the 32-credit program is $251.69 for residents of Iowa and $261.69 for non-residents. To apply for the program, students must fill out an NCC application for admission and submit it, with high school or prior college transcripts as well as ACT or Accuplacer placement exam scores (which must be completed prior to applying). The program's 2nd semester includes a practicum, and those wishing to continue with the certificate program complete an additional practicum. Some coursework - such as medical terminology, human anatomy and physiology, and pharmacology - is standard, but the program also includes a course that pharmacy technician students may not expect, public speaking, to help prepare them for communicating with a diverse range of people in the field of pharmacy. Students enrolled at NCC benefit from academic advisement, which is a requirement for all students, as well as free counseling and career placement services. Additionally, free computer access, developmental courses, individualized study, testing accommodations, study rooms and tutoring services are offered in NCC's The Learning Center. LSU at Alexandria was established as a 2-year commuter college in 1959 and enrolled its first class in 1960. The school has a long history of providing training for the health care industry; its first degree program was an Associate of Nursing in 1964. Since 2001, LSUA has offered an undergraduate certificate in pharmacy technology that is accredited by The American Society of Health-System Pharmacists. Today it is a 41-credit, 18-month program to prepare pharmacy technicians and assistants to complete the national certification exam with the Pharmacy Technician Certification Board and work in hospital, clinic, medical practice or retail pharmacies. To apply for admission to the program, prospective students must complete the LSU application. A high school GPA of at least 2.0 is required in core courses. Students also will need to submit scores for either the SAT or ACT. Following basic steps to apply for LSU admission, students must complete an application to the Department of Allied Health by May 1. Acceptances often depend on factors such as GPA or other factors deemed relevant to the program coordinator, especially if a high number of students are applying. Once students are admitted to the program, they can expect classes to include time spent in the programs simulation lab, called PioneerRx (a software that allows them to experience pharmacy scenarios), and to be followed by rotations at affiliated hospital and retail pharmacies. Throughout the program, students must maintain GPAs of at least 2.0, or at least a C average in all pharmacy tech courses and clinical experiences, in order to remain in the program. Tuition for residents is $407.35 per credit hour and $710.09 for non-residents, which not covers the cost of students' education but also the support services available for students, including career planning and placement, counseling, professional advising, advocacy for veterans and more. Ridge Technical College is 1 of 4 schools that have come together to comprise the Polk Education Pathways, an effort of Polk County Public Schools to help adults find the right paths to careers. Students wishing to enroll in Ridge Tech must take the Tests of Adult Basic Education, or TABE, a timed test which is a diagnostic tool that helps assess prior learning. (Students may not need to complete the TABE if they have associate degrees or meet other requirements.) Following that, students complete the Ridge application and participate in interviews with the Student Services Department, then register for their chosen programs (which may require additional steps). Applicants must be at least 16 years old and possess the aptitude for and interest in career education. Ridge's philosophy includes tailoring instruction to students of a variety of needs and employing an open-entry, open-exit, self-paced, individualized program. Students may progress at a pace that is right for them. Among Ridge's career training programs is a certificate pathway for pharmacy technicians. This 1,050-hour program prepares students to become eligible for the National Pharmacy Technician Certification Exam (CPhT) and work in hospitals, clinics or retail pharmacy settings. The program consists of 4 courses, all of which take place on campus during weekdays, though some take place in the evenings, for students' convenience. Tuition is $2.88 per course hour (not per credit), though lab and other fees are assessed as well, and the certification exam is $234. Ridge Technical College is accredited by The Council on Occupational Education and The Southern Association of Colleges and Schools, Council on Accreditation and School Improvement. MCTI is an educational center for adults who have disabilities in the state of Michigan. In fact, it is the second-largest rehabilitation training center in the U.S. Supported by the Michigan Department of Health and Human Services and Michigan Rehabilitation Services, this center located in Pine Lake, Michigan, has 72 acres of land and access to 700 feet of Pine Lake. Students may either live on campus or in off-campus apartments across the street from campus designated for MCTI students. Coursework is completed on campus and 13 training programs are offered, each with an active advisory committee made up of people who work in that industry in order to ensure that curricula meet workplace standards. Among these is a Certificate of Completion program for pharmacy technicians, with or without preparation for the Pharmacy Technician Certification Exam (PTCE) (although Michigan does not have licensure requirements for this profession). Applicants must clear criminal background checks, have no criminal charges pending and pass an interview with an instructor prior to acceptance. Students who most closely match the occupational profile for pharmacy technicians - including strong communication skills, an even temperament and certain physical abilities - are selected for the program, which can be completed in 3 terms, or 30 weeks. Students receive hands-on experience in cashiering, inventory management and pharmacy receiving and distribution in MCTI's on-campus store and pharmacy lab. In order to graduate, students must earn a GPA of 2.0 or better and have good employability skills. The 3rd term involves a work externship in a retail pharmacy, which may take place after school or on weekends, and some students possessing skill for working in a pharmacy setting may be invited to take courses to prepare for the PCTE exam and be provided an externship in a hospital setting (which may require passing a drug screening). In total, the program is 36 credits, or 38 for students invited to complete additional certification prep. Student support services include medical and counseling services, occupational therapy, interpreters for deaf students, classroom and job accommodations and job placement services. Minnesota State Community and Technical College is a comprehensive, public, 2-year college with 4 campuses in Minnesota; in Detroit Lakes, Fergus Falls, Moorhead and Wadena. It was created through a merger of Fergus Falls Community College with 3 campuses of Northwest Technical College to provide a more robust education to area students in both the arts and sciences and career and technical programs. M State offers a hybrid (online plus on-campus requirements), 40-credit diploma program in pharmacy technology that prepares students to pass the Pharmacy Technician Certification Exam (PTCE). If a student passes this exam and works for 1 year in a sterile compounding pharmacy, they can earn the Compounded Sterile Preparation Technician (CSPT) certification in collaboration with the employing pharmacy. Graduates are then prepared to work as entry-level pharmacy technicians in a variety of pharmacy settings, including hospital, community or long-term care. All the coursework in this program is delivered online through the D2L Brightspace classroom environment, but in-person weekly labs on the Wadena campus and 320 hours of clinical rotations are required and are offered in the summer and fall semesters. The online course delivery adds a fee of $38.25 per credit to tuition costs, though in-state and out-of-state residents pay the same base tuition rate. Additionally, the fee to take the PCTE exam is $50. To apply to M State, students must submit the online application and fee, as well as high school/GED and college transcripts. To apply for the pharmacy tech program, a separate additional online application must be submitted, and students must take an ACCUPLACER exam, clear a background check and drug screening and submit proof of immunization. This community college in Miles City, Montana, was founded as a junior college in 1939 in a block of empty rooms at the local public high school. When it received a $1.5 million grant from the Montana Coal Board in 1977, the school was able to construct a new vocational building and over the years began offering a host of vocational and technical career training programs. Among its offerings is a Certificate of Applied Science for pharmacy technicians. Students seeking admission into the program must submit an application to the college as well as a signed pharmacy technician-in-training certificate from a licensed pharmacist. ACT and SAT scores should be submitted to assist with appropriate course placement. Beyond that, MCC is committed to an open admissions policy, so that anyone over 18 with a high school diploma, GED or adequate ACCUPLACER score may be admitted into the college. Coursework in the 32-credit, 2-semester C.A.S. Pharmacy Tech program may be completed online or on campus and must be completed in the MCC prescribed sequence. MCC does charge additional fees for distance learning credits: $35 per credit for online or interactive television (ITV) classes. Upon completion of this C.A.S. program, aspiring pharmacy technicians are prepared to take the Pharmacy Technician Certification (PTCB) exam and go on to practice as licensed pharmacy technicians in hospital, clinical or retail pharmacy settings. All MCC students, regardless of whether they are completing courses online or on campus, may utilize the free resources provided by the college, including tutoring for up to 2 hours per subject per week, full-service personal counseling services from the school's local network of private practice counselors, online writing and research help and more. The pharmacy technology program at Stanly Community College prepares graduates to assist pharmacists and understand all areas of pharmacy as well as practice and safely handle, store and dispense medications. Students can choose from 2 options: a 75-credit AAS or a 40-credit diploma program, both taught on SSC's campus in Albemarle, North Carolina. Students learn how to prepare prescription medications, mix intravenous solutions and other specialized medications, update patient profiles, maintain inventories, package medications in unit-dose or med-card form and gather data used by pharmacists to monitor drug therapy. Courses include pharmacy practice, pharmacy calculations, pharmacology, trends in pharmacy, sterile products, pharm dosage forms, community pharmacy, hospital pharmacy and basic anatomy and physiology. Both the AAS degree and the diploma program require clinical experiences in which students work in pharmacy settings under a pharmacist's supervision. Through the hands-on experience, students learn effective communication with personnel, proper employee attitude and how to dispense medications, prepare patient charges and operate computers. Graduates are eligible to take the national Pharmacy Technician Certification Exam. Employment opportunities include positions in retail and hospital pharmacies, nursing homes, research laboratories, wholesale drug companies and pharmaceutical manufacturing facilities. Student support services include an academic support center, writing center, advising, career counseling, library services and financial aid. Stanly is accredited by the Southern Association of Colleges and Schools Commission on Colleges. The pharmacy technology program at Vincennes University, which is available on campus and online, offers both a 1-year certificate program (33 credits) and a 2-year AS degree (60 credits). The coursework for both levels fulfills the Indiana training requirement for pharmacy technicians and prepares students to take the National Pharmacy Technology Exam. Students also participate in a 1-semester practicum in an affiliated hospital or pharmacy to gain experience working with patients and pharmacy professional staff. Pharmacy technicians assist pharmacists in dispensing prescription medications to customers and/or health care professionals and typically work in retail pharmacies and hospitals. Pharmacy technicians in a retail pharmacy may be required to stock and inventory medicine, maintain patient records, measure medications into containers, type prescription labels, prepare insurance forms and manage a cash register. In a hospital pharmacy, technicians may prepackage medications, prepare sterile intravenous meds, maintain nursing station meds, collect quality improvement data and deliver meds to patients. Student resources include academic advising, career counseling and financial aid. The pharmacy technology program is accredited by the American Society of Health-System Pharmacists, and VU, located in Vincennes, IN, is accredited by the Higher Learning Commission. The Certificate in Applied Science in Pharmacy Technician at West Virginia University at Parkersburg prepares students to function as pharmacy technicians under the supervision of a licensed pharmacist. The 30-credit course takes 2 semesters to complete on campus in Parkersburg, West Virginia. Pharmacy technicians prepare and dispense medications, maintain patient profiles and manage inventory in community and institutional pharmacy settings. Students learn the safe preparation and delivery of medications to patients through a combination of classroom presentations, campus laboratory practice and clinical experiences. Courses include pharmacology, medical terminology, and calculations for pharmacy technicians plus 2 clinical components, 1 in pharmacy practice and the other in clinical community pharmacy. Since WVU at Parkersburg's pharmacy technician program began in 2008, graduates have amassed a 100% pass rate on the national Pharmacy Technician Certification Exam. Student resources include academic advising, tutoring, career services and financial aid. WVU at Parkersburg is accredited by the Higher Learning Commission, and the pharmacy technician program is approved by the West Virginia Board of Pharmacy. While many programs for pharmacy technicians require some on-campus coursework, Alaska's largest university, the University of Alaska Anchorage, offers a pharmacy technology program completely online. Students will graduate with an Occupational Endorsement Certificate through a curriculum that meets the Model Curriculum for Pharmacy Technician Training by the Accreditation Council for Pharmacy Education (ACPE). Through 2 semesters of full-time enrollment, students will take 6 courses, which amounts to 16 credits. The course tracks include the option of either a fall or a spring start time. Course examples include introduction to pharmacy, pharmacology and techniques of pharmacy practice. All courses are taught by experienced pharmacists and pharmacy technicians who are familiar with the professional landscape and can provide hands-on mentorship and education. Additionally, students will be prepared for Alaska State pharmacy technician licensure and to pursue further study in pharmacy. According to the Alaska Department of Labor, the career outlook for pharmacy technicians in Alaska is positive and the average hourly wage is $19.44. Distance education is also a growing element of the University of Alaska's offerings. The UAA eLearning support services help act as a liaison between students, faculty and academic departments for online coursework and help as a technical support role as well. Through their work with the United States Distance Learning Association (USDLA), the university has hosted events to showcase new technology that helps distance learning thrive. 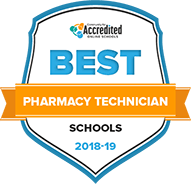 As the accredited program of its kind in the region, Southeast Technical Institute in Sioux Falls, SD, has a pharmacy technician diploma program that can be completed in as little as 1 year. Southeast Tech's pharmacy technician program is designed to get students into the workforce efficiently and effectively and to build career skills and "workforce confidence" that will give graduates a leg up with some of the region's best employers. The program offers a rigorous and comprehensive full-time curriculum, requiring 48 credit hours over fall, spring and summer semesters. All coursework is designed to fulfill learning outcomes involving science and technology skills and comprehension, problem-solving and critical thinking skills, the demonstration of professionalism and strong communication skills. Examples of courses include basic anatomy and physiology, pharmacology, math for pharmacy, pharmacy law and ethics, and clinical practice. The program is designed to prepare students for pharmacy technician certification and even includes a course on certification review. The program boasts that most pharmacy technician students are hired even before graduating. Graduates have gone on to work for compounding pharmacies, hospitals, insurance companies, radiation pharmacies and research centers. Southeast Tech has an accessible, dedicated admissions representative for the pharmacy technician program who is knowledgeable about the program and can answer targeted questions from prospective students. Financial aid options, including grants and scholarships, are also available at Southeast Tech. Part of Southeast Tech's mission is to make education as affordable as possible so that graduates have little to no debt to carry with them. Northshore Technical Community College provides students with a pharmacy technician program that can be completed in 1-2 years. This program is available at 3 of NTCC's campuses: Florida Parishes Campus in Greensburg, Louisiana; Hammond Area Campus; and Sullivan Campus in Bogalusa, Louisiana. Graduates earn a Certificate of Technical Studies (CTS) after completing extensive clinical hours as part of their training. They are then eligible to take the pharmacy technician exam administered by the Pharmacy Technician Certification Board. Graduates of this program have obtained careers as certified pharmacy technicians, pharmacy sales associates and certified nurse assistants. NTCC provides a range of financial aid options for students, including loans, federal and state grants and scholarships. Pharmacy technician students are eligible for the Alphonse "Gator" Abadie Memorial Endowed Scholarship, Joan King Smith Memorial Scholarship and Sullivan Vocational Foundation Endowed Scholarship. Students may also apply for special state-funded scholarships through the Taylor Opportunity Program for Students (TOPS) program, which can provide full tuition awards and potential stipends to recipients. If a student is a resident of nearby Mississippi counties of Amite, Pike, Walthall, Marion, Pearl River or Hancock, they may qualify for NTCC's tuition reciprocity program, which offers students from these areas a reduced tuition rate. NTCC accepts veteran benefits as well. New students can receive help through academic advising resources, and both current students and alumni of NTCC can utilize the college's career services for help with resume development, to complete mock interviews, and to receive assistance in searching for jobs and filling out job applications. With over 50 years of academic success among its graduates, Crowder College, accredited by the Missouri Department of Elementary and Secondary Education and the Coordinating Board of Higher Education, has both the experience and drive to provide positive outcomes for its students. The college's Allied Health department has designed unique programs specifically to launch students into careers in the health fields. Within the department, Crowder offers a unique certified pharmacy technology program for students wishing to enter into the pharmacy technician arena. The program is designed to support the growing pharmacy technician field. In anticipation of this, the program is specifically geared toward Missouri State and national pharmacy technician certification. The program requires a modest 16 credits to complete. Courses include pharmacy techniques (I & II), business computer applications, pharmacology concepts and a pharmacy tech internship. In order to complete the program, students must take 1 of the 2 national certification exams - whichever is geared to the student's specific goals of either working in a hospital or retail environment. Passing the exam is None for obtaining the certificate. Crowder offers generous financial aid packages to its students, and there may be some scholarship opportunities for vocational students, including pharmacy technology students. Crowder also offers comprehensive support to its enrolled students, such as testing and tutoring services, counseling services and specific support to students from an agricultural or migrant background through its CAMP (College Assistance Migrant Program). Students at South Suburban College can test out a career as a pharmacy technician by enrolling in an introductory 6-credit hour course that presents some of the basics of this college's certificate program. The 39-credit certificate program, however, prepares students to enter careers in a range of health care settings, including hospitals, home health care agencies and clinics. In the certificate program, accredited by the American Society of Health-System Pharmacists, students complete general education coursework and pharmacy technician training classes. Additionally, students will participate in 300 clinical hours in community and hospital pharmacy settings. The Pharmacy Technician Program Certificate is available to both full-time and part-time students and even offers required courses at night for convenience. Students currently working at pharmacies can receive customized clinical placements, depending on their work experience, and can earn up to 75 hours of internship credit toward their certificate. The coursework a student completes in the certificate program can also be applied toward an associate degree in general studies through SSC. Students in this program are eligible for financial aid, and residents and employees of Lake County, Indiana, may qualify for special residency tuition, which offers tuition at a lower rate than out-of-district and out-of-state students. There are a range of scholarships available through SCC and private donors to the college, as well as state and federal grants. Veterans can receive state and federal military benefits, including benefits for dependents of military personnel and Illinois National Guard members, in addition to receiving financial aid. All students can also access SCC's Counseling Center to receive academic, career and personal counseling to help them meet their educational and professional goals. What are the best online pharmacy tech degrees? With Penn Foster Career School's Pharmacy Technician training program you will get the training that will help you on your path towards working closely with pharmacists in providing medication and health care products to patients. Whether you'll work for a retail pharmacy, local druggist, grocery store, or hospital, you'll be an important part of a rewarding profession. Our program is convenient, affordable, accredited, and led by leading faculty. Since there is no set class schedule, you study at a time, location, and pace that works for you. The exact compensation a pharmacy technician can expect will depend on where they work and their level of experience. Generally, pharmacy technicians will make more money in a hospital than a retail pharmacy. However, the level of experience can play a significant role in expected salary as well. To give a broad overview of what pharmacy technicians can make, check out the chart below. To be competitive in the job market, an individual must earn either a certificate or associate degree in pharmacy technology. While the associate degree isn’t required to become a pharmacy technician or sit for the certification exam, it does provide a broader educational background that may open more professional growth opportunities, including a future in teaching or management. The opportunity for specialization is possible with specific courses and certifications offered by the National Pharmacy Technician Association in areas such as compounding and chemo. These certifications can also be obtained through coursework available within formal pharmacy technology programs. Students learn the array of rules, regulations and laws that apply to the dispensing and handling of pharmaceutical drugs. Teaches the mathematical concepts needed to calculate dosages and complete compounding tasks in a pharmacy. Discusses all aspects of the pharmacy technician field, including certification requirements, ethical considerations and legal responsibilities. Provides an overview of how medications interact with the human body, especially when treating diseases. Real-world experience working in a pharmacy setting under the supervision of a licensed pharmacist. Students learn aseptic techniques and compounding sterile preparations within the applicable legal framework. Becoming a pharmacy technician involves much more than just signing up and completing a program. One of the first things prospective students should do is make sure they have the necessary qualities to succeed as a pharmacy technician and enjoy that type of work. For example, pharmacy technicians must be extremely detail-oriented. If mistakes are made filling prescriptions, people can die. It’s also helpful to be organized and be able to multi-task. A pharmacy technician may fill numerous prescriptions while interacting with customers and answering their questions or directing their concerns to the pharmacist. Finally, pharmacy technicians must have good listening skills. They serve as the first line of interaction between the pharmacy and the customer, so they must accurately understand the concerns and issues of those who ask questions. Assuming individuals have the qualities to succeed in the pharmacy technology field, they can move through the following steps. This is a minimum requirement to achieve certification as a pharmacy technician. Time to complete: Four years. You obviously want to be a pharmacy technician, but do you have other aspirations, such as teaching, becoming a full-fledged pharmacist or going into management? If so, your educational path may be much different. Time to complete: Varies. Most pharmacy technicians will either get an associate degree or certificate. Time to complete: Varies. Assess personal and financial resources. How much time and money you have readily available may determine the educational path most possible for you. Time to complete: Varies. Decide on a pharmacy technology program. Pharmacy technology programs are very popular and widely available. Because you now know your available resources, along with the career and educational paths you wish to take, you can effectively research programs and apply for the one you choose. Time to complete: Varies. Accreditation is critical because it ensures you will receive an education that meets certain minimum standards. Graduating from an accredited program is also important for finding a job as a pharmacy technician. Time to complete: Less than one month. Admissions requirements will differ depending on the school and program. Students may need to take an admissions test, such as the SAT or ACT, complete essays or get letters of recommendation. Time to complete: Less than a month. Register for the SAT or ACT. Some programs may require applicants to take the SAT or ACT. If your chosen program has this requirement, you’ll need to register for the applicable test and begin studying for it. Time to complete: Three to six months. If you needed to write application essays, gather letters of recommendation or complete any other requirements for admission, complete them soon so you can formally apply to your chosen pharmacy technology program. Time to complete: Less than six months. With any entrance exams taken and application requirements finished, now it’s time to submit your application. Time to complete: Less than a month. Most employers will conduct background checks on employees before hiring them. Additionally, a criminal history may disqualify some individuals from becoming pharmacy technicians, such as those with certain drug offenses. Time to complete: Less than three months. Complete the FAFSA (also known as the Free Application for Federal Student Aid) and see what financial aid you may be eligible for that can help pay for the cost of schooling. Time to complete: Three or more months. After you’re accepted, it’s time to hit the books. Do your very best to get good grades so you can stand out among the pharmacy technicians in your class and in the job market. Time to complete: 18 to 24 months. Though you may be enrolled in an online program, your curriculum will have in-person course requirements that test your skills and knowledge in a pharmacy setting. Time to complete: Varies. There are two certifications available; one is offered by the Pharmacy Technician Certification Board and the other by the National Health Career Association. Applicants may need to pay registration fees and schedule to take their exam. Time to complete: A few weeks. Without certification, students will face an uphill battle finding work as a pharmacy technician, so passing this exam is critical. Time to complete: Varies. If you made good grades, impressed your supervisors during the hands-on portions of your coursework and became certified, you should be able to find a position as a pharmacy technician. Start applying for jobs. Time to complete: Varies. Certification must be maintained. This includes completing continuing education requirements every few years. Time to complete: Less than a month. Choosing the best pharmacy technology program can shape your professional future. When choosing a program, consider several points, many of which have been discussed above. But there are still a few other things to think about when finding the best online program. First, check the school’s in-person curriculum requirements. Even though students may be enrolled in an online program where most course requirements can be satisfied remotely at any time during the day, some in-person requirements are still in place. Take this travel requirement into consideration when choosing a program. Second, check a program’s career services offerings. Graduates can find post-graduate employment without any outside help from their school, but it’s certainly a lot easier when a career services office can get you in touch with contacts at desired places of employment and provide job search advice, like resume reviews and mock interviews. Scholarships and grants are desirable because they do not need to be repaid like loans do. There are literally thousands of scholarships and grants available to postsecondary students. Below is a list of some places pharmacy technology students can find scholarships specifically tailored to them. Scholarships are a form of financial aid that doesn’t need to be paid back, so they are among the most desired of financial aid awards. Scholarships are usually awarded based on individual merit. This merit can include high academic performance, but might also go to students who specifically choose to study in pharmacy technology. The following is a list of resources than can help students find scholarships to pay for their pharmacy technology schooling. Provides a detailed list of scholarships for students entering academic programs for a future career in pharmacy-related fields. One of the premier online resources for scholarships. It has a section specifically for pharmacy tech students. Grants are like scholarships because they don’t need to be paid back. But unlike scholarships, they are usually based on financial need, not merit (although merit is sometimes a factor). To be eligible for most grants, students will usually need to apply for financial aid including the completion of the FAFSA. For more information about grants for pharmacy technology students, check out the following resources. Offers a Scholarship Finder that details various financial aid opportunities, including grants, scholarships and fellowships. Available to undergraduate students working toward a bachelor’s or professional degree with the primary criteria being financial need. When choosing a school for pharmacy technology, students must make sure the program offered is accredited by the American Society of Health-System Pharmacists. This not only ensures graduates from the program will be able to sit for the applicable certification exam, but that students will be eligible for most financial aid offerings. Practically all financial aid awards will only be available to students who attend an accredited academic program.